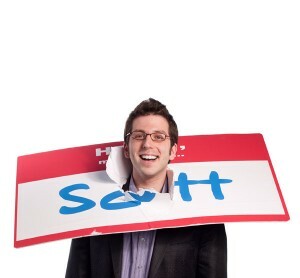 Now You Can Become as Trusted as Oprah without Resorting to Brainwashing or Jedi Mind Tricks - HELLO, my name is Scott! The more people trust IN you, the more they will bet on, buy from, follow after, stand beside and tell others about you. She smiled back; picked out the coins she needed and completed the transaction. Piece a’ cupcake. And any time I bought anything during the remainder of my trip down under, I used the same technique. Worked every time. Lesson learned: If you want people to trust you, try trusting them first. Even if you have no logical reason to do so. You’ll discover that when you approach others as (already) being trustworthy, they rarely prove you wrong. Are you willing to ante up first? 2. Lower the threat level. “I don’t want to have to be the first person to trust this guy.” During the buying process, your potential customers are likely to have this concern. Your mission is to prevent this type of emotional resistance from entering their minds. One suggestion is to collect and share video testimonials of past customers voicing that same concern. Ask the people who trust you WHY they trust you. Better yet, ask them cite specific examples of how you overcame their anxiety with your amazing service. The threat level of your future customers will lower immediately. Also, you might consider adding a Media Room to your website or blog. By updating a chronological record of every publication that featured, quoted or mentioned you or your company, mass social proof will accumulate. Then, fear will dissipate. How are you going from red to green? Therefore: Avail yourself. Be vibrantly vulnerable. Create a plan for slowly and appropriately revealing your truth to the people you serve. How are you using truthfulness to build trustworthiness? 4. Less talkey, more doey. Trust requires evidence, not eloquence. Therefore: The more venues in which you reveal yourself, the more trust you will earn. And the more people trust IN you; the more people will buy FROM you. So, take action: Start a thought leadership blog. Or, begin posting short, relevant, helpful videos. Perhaps share pictures of you, in your element, doing what you do. Remember: Don’t put your money where you mouth is – put it where you feet are. Most people trust (only) movement. Are you keeping secrets? 5. If you have to “persuade” people, odds are, trust is low. As Margaret Thatcher once said, “If you have to tell people you are, you probably aren’t.” Which makes sense. Think about it: Apples never make health claims. They don’t have to. Snackwells’ poisonous-processed-pumped-full-of-sugar-and-other-crap cookies, on the other hand, do. Because they’re toxic for your body. Of COURSE the box will proclaim their low-fat benefits. Lesson learned: Be careful not to come off overly persuasive. People can’t trust your words if they’re too busy questioning your motives. Are your efforts to become more trustable working in reverse? 6. Surprise people with your impeccable word. “Wow. He actually did what he said. Didn’t see that one coming.” How profitable would it be if your customers said that about you? How equitable would it be if your customers said that about you …to their friends? Psssht. You’d have more new business than Netflix. Remember: When trust is at an all time low, the opportunity to floor people with your unexpected integrity is high. How could you surprise people? 7. What will it take to get people to see your name daily? And, what consistent value and promise will be attached to your name when they see it? Those are the big questions. And whether your answers involve blogging, tweeting, or updating your Facebook status, remember the secret: Meaningful Concrete Immediacy. Be relevant, be concise and be actionable. Still be human, of course. Just remember that “seeing your name daily” will start to get REALLY annoying if your updates include words like “My cat just,” “Waffles for breakfast” or “My idiot husband left the seat up again.” Remember: If you want to become a proven entity, trust comes from constant exposure. 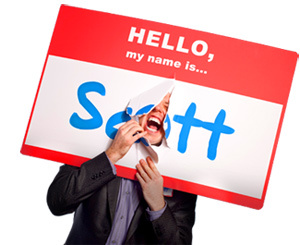 What do people think when they hear your name speak? 8. What could I do to establish instant credibility in this moment? This is a question to silently ask yourself during meetings, on sales calls or when out to lunch. For example, maybe now is the perfect time to share that story about an expensive problem you solved for a client. Or maybe that article about your website in the current issue of FastCompany would be a worthwhile visual aid during this product demonstration. It’s all about leverage and timing. Are you punching people in the face with your credibility? *What are you known for knowing? *What do you know that people would pay to learn? *What value are you prepared to give to others so that they will voluntarily give you their money? Once you uncover those truths about your unique value, you’ll be able to pack it into everything. What are you a source of? 10. Be funnier. In 2009, John Stewart was voted as “American’s #1 Trusted News Source.” Now, keep in mind; John Stewart is a comedian. His show airs on Comedy Central. And yet, he beat out mainstream news veterans like Anderson Cooper, Brian Williams and Bill O’Reilly. Why? Because Stewart is funny as hell, and those other stiffs are not. Period. Lesson learned: Just be funny. Humor is the great catchall. If people perceive you as being funny, you’re halfway home. What have you done in the past month to become funnier? REMEMBER: You can’t make anybody trust you. All you can do is increase the probability that they will bet on, buy from, follow after, stand beside and tell others about you by making yourself more trustable. And you don’t even need to use brainwashing or Jedi mind tricks. What steps are you taking to boost your trustability? For the list called, “12 Ways to Out SERVICE Your Competitors,” send an email to me, and I’ll send you the list for free!